2009 was announced to be the International Year of Astronomy. 400 years ago Galileo Galilei was the first to use telescope for observing the sky. I am a big astronomy fan since childhood. 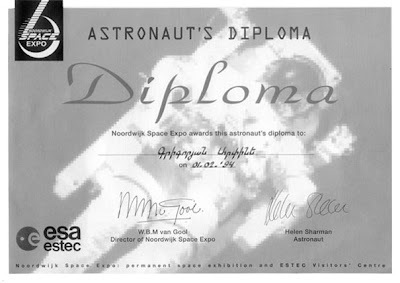 It started in February 1994, when I was in The Netherlands and was taken to the Noordwijk Space Expo. One day when I was 14, walking in Vernissage (flea market in Yerevan) with my mother, I saw a wonderful book on astronomy in Armenian. It was among some old books from old home libraries that people usually sell in Vernissage. It costed 2000 dram and my mother bought it for me without any hesitation. It was my first and best astronomy book ever. It was brand new and even published in the same year ! I haven't had any book of that quality before. Called "ASTRONOMY" from the "eyewitness guide" series, it turned to be an Armenian translation of the Dorling Kindersly edition. It was hard covered, high-quality publishing on a glossy paper with colorful illustrations that was published in Armenian with the help of Vatche & Tamar Manookian charitable fund. Taking into account the quality of books we were studying with at schools that years, this book was more than wonderful. It helped me not only to satisfy my curiosity, it meant a lot ! I felt it as it was sent to me from above. That time and many years later I was carrying that book whenever i was going out of the city overnight, to watch the sky and tell my friends about the constellations and some interesting astronomy facts. I don't know what events are planned to be organized in Armenia this year but I'll try to participate and restore and renew my hobby. About the film and download links in Russian.